I did manage one evening at home, but I didn't have time to arrange the Boating Adventure so that will have to wait now till after Cold Wars. However, my friend Jerry dropped over to collect his copy of Black Powder which had arrived on Thursday (several of us took advantage of the cheap amazon.ca price to place a group order to get free shipping). Since I was in the midst of sorting the NQSYW figures to take to Cold Wars, it made sense to divide them up and play a few turns to get a feel for the rules. Each Charge! company became a Black Powder battalion etc. Since it was a quick trial to get the feel, we kept it very simple using CV8 commanders and basic troops from the list of templates. Once again I did not have my camera to hand but instead my new HTC Hero smart phone. Not so good at dimly lit conditions (and my lighting is atrocious at the moment) and hard to brace. I'll have to check out settings, practice, and make sure I have my camera at Cold Wars! Meanwhile, imagine a quick water colour sketch giving a broad sweeping view of the action rather than a detailed mural. On the left under General Legge, we have the French, on their right, a "Brigade" composed of 1 Squadron each of Fitzjames and the Colonel General's Regiment, a gun and 2 battalions of infantry (Picardy and de Roi iir), and on their left, a "Brigade" composed of 1 squadron each of Orleans and Lanciers de Saxe, 1 guns, a battalion of Chasseurs and 2 battalions of infantry (La Reine and Languedoc). On the right commanded by the venerable MacDuff, we have the army of Rosmark, on their left a "Brigade" with 2 squadrons of the Crown Prince Dragoons, a gun, a battalion of Prince Michael Pandours and the Grenadiers and 1st Battalion of MacDuff's Fusiliers. On their right a "Brigade"composed of 2 squadrons of Moravian Hussars, a guns and the 2nd and 3rd battalions of MacDuff's Fusilers. 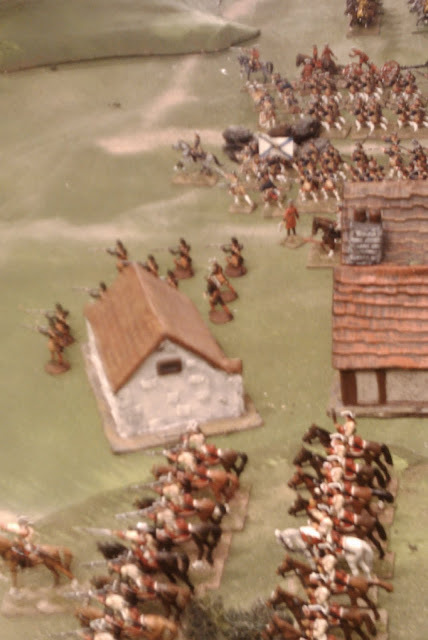 The game began by a swift advance by the French right which deployed in a firing line around a stone house. 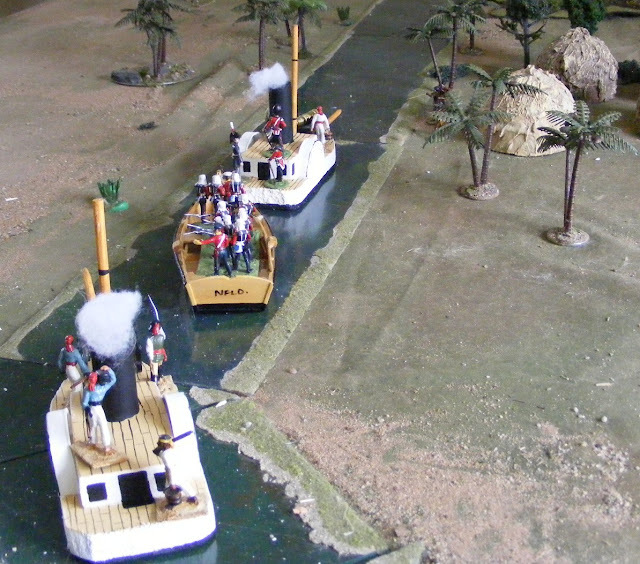 This was followed by a tentative creeping forward of 2 march columns and the limbered gun on their left. An opening salvo from their gun did no damage. The Rosmarkians (Rosmarkers? Rosses?) advanced and deployed along the line. An order to the Hussars to sweep forward and ride over the limbered enemy gun resulted in a lengthy, stirring speech by their Colonel followed by a leisurely walk-march to the top of the hill. The guns and skirmishers opened fire causing some damage to the enemy. On the 2nd turn the French right was all set to creep forward when we realized that the Pandours were within 12" which was sufficient to cause them all to pause and rethink the matter. (ie the minus one made it a failed Brigade order). 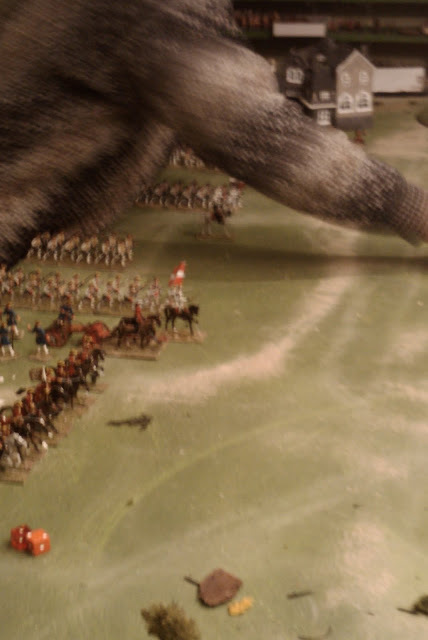 On their left, the infantry formed attack column, the gun deployed and the cavalry and skirmishers came up into line. The French fire disordered the Pandours but did no other damage. MacDuff's 1st battalion moved forward into line with the Pandours, supported by the Grenadiers but the 2nd and 3rd battalions mistook the order to advance and open fire as an order to return to camp and light their fires. (Blunder, retire 2 moves) Since it was a test game and they were 23" from the edge, we halted them there instead of rolling to come back on. The artillery, Pandours and MacDuff's opened fire causing several casualties and disordering 2 French battalions. The yellow Hussars drove back and disordered the lancers but declined to pursue into the enemy cavalry. On the 3rd turn, the French had 4 units within initiative range, but 2 were disordered and unable to move. La Reine charged into MacDuff's who blasted them with 3 hits and a disorder. The Orleans cavalry charged the 1st Squadron of Hussars who countercharged, leaving their supports behind (luckily as it turned out). The French fire disordered the poor Pandours again, (apparently the red pants make a good target), and put a hit on one gun. The melee was a hard fought draw with fantastic saving throws but the shaken La Reine had to check morale and fell back. The Hussars were ridden over by their heavier enemy and were dispersed but Orleans were disordered and unable to pursue. On the Rosmark turn, the remaining Hussars charged the disorderd Orleans while the 1st Battalion of MacDuff's moved forward and poured another close range volley into the enemy while the gun pounded the shaken column. 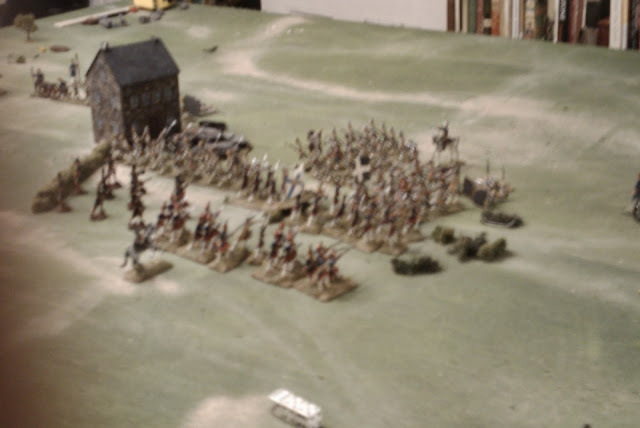 Orleans were no match for the fresh hussars and routed, sweeping away the supporting gun and skirmishers. The shaken column also took more hits and broke. At this point, with 4 French units broken and 2 more shaken vs 1 broken Rosmark unit, we called the game so I could continue packing. Clouds of gunsmoke blur the view even more. OK I figured these guys deserved another picture now that the Captain's hair has turned grey and the men are all polished up and shiny. 10 days till I leave for Cold Wars. I know I said I wasn't going to do frumpy militia but they were already cast and I realized that I could use a battalion of light infantry so.... the Pandours have been promoted to light infantry and the Burghers of St. Stephen have been called to arms. I managed a few hours at home on Saturday afternoon and since I am in the process of moving my wargaming and history books into my new games room, I decided to get a start on rough sorting them. (They have gotten rather jumbled after 4 or 5 temporary displacements during moves and renovations over the last 5 years). Since my goal is to fit books. miniatures and scenery into the room comfortably, I need to thin the library like I have been thinning the ranks of my armies even though its not a large library to start with, probably under 400 titles including pamphlets and Ospreys as well as "real" books. I have dabbled in a lot of periods over the last 40 years and every wargame interest has been accompanied by books and I've been rather assuming that the number of books would roughly correlate to my wargaming projects. http://www.lochsloy.ca/macduff.htm. Well, yes and no, I haven't done a formal tally or finished sorting (one day when I retire-retire, I should catalogue it all) but a rough estimate provided a surprise. Now, the one 'period' that has been most persistant has been ancients in the broadest sense. So, I should have lots of ancients books, right? Well, if I throw in some dog eared Penguin Classics, some Armies and Enemies and a couple of Ospreys, I'm still not sure that there's a dozen of them! (what??). Apparently, I relied a lot on libraries. There are possibly another 1/2 dozen non-fiction on Arthurian Britain which added to various non-fiction covers the Prince Valiant project. My 16thC Scots, English and French seem to be supported by another measly 1/2 dozen or so books which can be doubled if I include the earlier Anglo-Scots wars which these armies will stand in for if I get the urge to refight Bannockburn or Stirling Bridge. 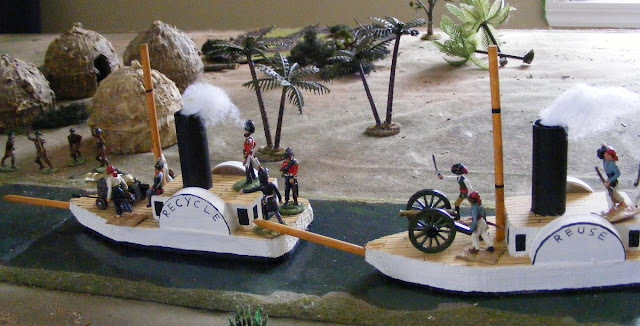 The War of 1812, a small project, easily exceeds a score of books but the American Revolution doen't even make it to 6. The Not Quite the 7 Years War project which now carries the entire 18thC on its shoulders has another measly 6 or so, perhaps a dozen if you include the French and Indian Wars. 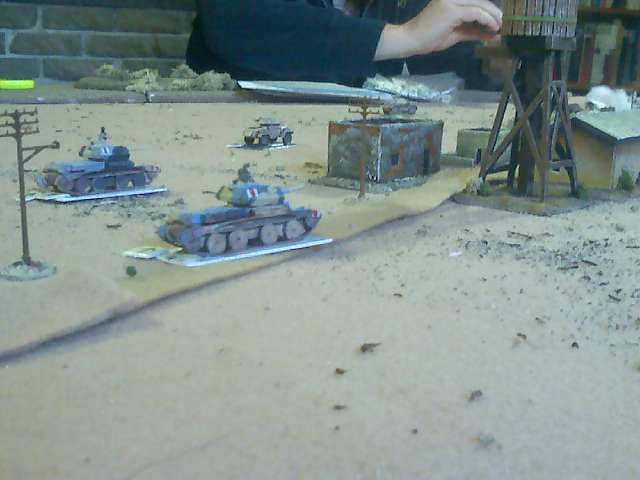 My 2 latest mini-projects, Russian Civil War and fictional 1960's don't seem to have ANY real support! The last remaining project which is scheduled to remain is the Faraway and Oberhilse project, a fictional coverage of all things Victorian. If we include books on Victorian campaigns from the 1837 rebellions in Canada to the 2nd Boer War, we easily top 100, adding in non-British campaigns in that time period, the Greek War of Independence, Russo-Turkish Wars, the Mexican American War, ACW etc, we're starting to push 150. That caught me by surprise but shouldn't have really, I have had a fascination with British Colonial Wars since childhood. Inspired by various books, they featured prominently during my pre-wargaming teens when I was converting 54mm toy soldiers into model soldiers and after discovering Featherstone's Battles with Model Solders, the very first Airifx skirmishes were fought with vaguely converted Boer War-ish Canadian troops against some rather US Civil war looking Fantasians (Fantasians being a common enemy for Canadian forces excercises in those days). 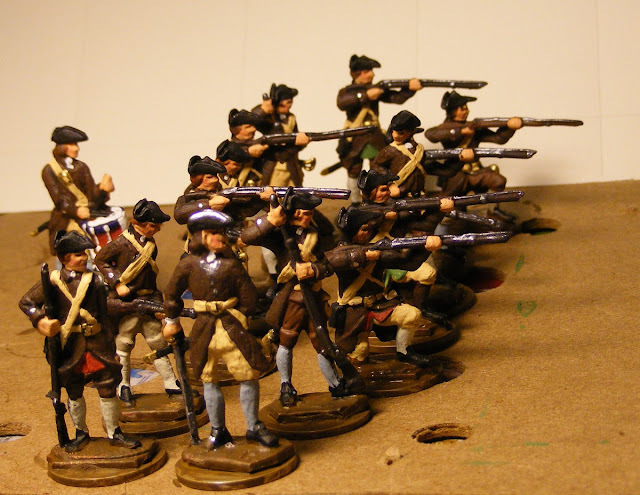 In the mid '90's I finally allowed myself to dabble in Colonials in 25mm and then in 54mm. Those armies have mostly been sold off with the intent of focussing on the 40mm's but the project has crawled haltingly. In part this is due to my habitual dabbling in other things and in part due to interference from various "life events" but perhaps I have also been subconsciously "saving the best for last"? In any event, it seems that perhaps I should listen to the books and focus a little more time on energy on that life long interest that keeps getting pushed to the back. Burning British tanks in the desert. Nothing like starting at the end but I parked my camera upon arrival at Martin's and forgot about it until after we called the game. This game was a refight of one fought about 6 weeks earlier using CD5 and was an interesting exercise as well as an enjoyable game. The table was slightly different than last time, (see picture in previous post) but close enough, the forces, situation and mission were all the same. This was the first BKC game for 2 of the players and my 1st BKC2 game so we kept things simple and counted all troops as regular and used CV8 HQ's and didn't try any of the new optional rules. In the middle was a small town defended by a company of mechanized (carriers) British infantry supported by a battery of 2 pounders, a battery of on-table 25 pounders and a squadron of MKVI light tanks. Once the Italians were spotted, a tank regiment was called to the rescue, arriving piecemeal. There was also some wire and a hidden minefield. The Italians had a battalion of motorized infantry and a battalion of tanks, supported by extra mortars, all off table to start with. Their mission was to capture the town, their plan was to send the motorized infantry around the left flank, a company of light tanks up on the right to probe and "amuse" the enemy, and the companies of painfully slow M13 and Semovantes up the middle to provide fire support. I have rarely seen so many crummy command rolls in one game but essentially the plan worked, well, apart from the bit about actually attacking the town (let alone capturing it). The infantry drove up in dead ground on the left and debussed behind the crest of a hill just as the squadron MKVI's came roaring over the top, MG's blazing. The infantry went to ground and opened up with anti-rifles with minimal effect but the CO brought up the lagging armour and with one MKVI burning on top of the hill, the remainder wisely slipped back into dead ground and started calling in artillery fire as the infantry pursued over the crest. 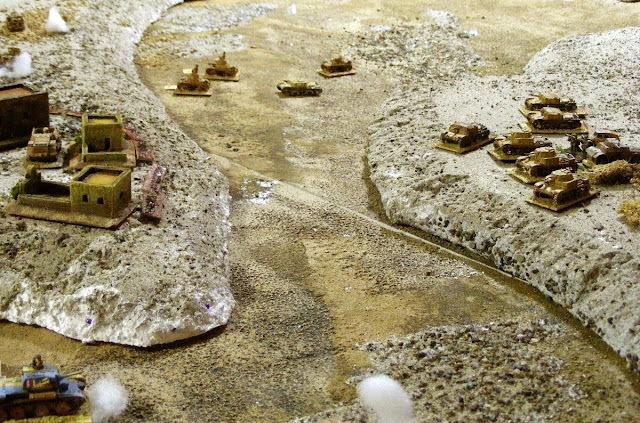 A vickers opened up from in the town to thicken the fire and as platoon after platoon of Italian infantry was forced to retreat back over the crest, the advance stalled. On the British left, an attempt to rush an anti-tank gun into the center was met by a huge mortar barrage and the Bren carrier that was towing it caught a few shells in the open top and brewed up. The remaining 2 pounder ambushed the Italian light tanks when they finally got their act together and advanced but at long range, all it managed was to stall that prong while giving the Semovantes something to shell. At long last, the British cruisers had arrived in penny packets and crept up the center then hit one of those little glitches that happen in the desert. Three of the British tanks found themselves momentarily in the open, just within the Italian extreme range and just out of their own. The rest of the British tanks were in dead ground or far to the rear. In minutes there were 3 burning cruisers and 2 more burning light tanks. At that point we had to call the game on time, the Italians had failed to capture the town but had knocked out 6 tanks, 2 AT guns and an MG for the loss of 1 infantry stand. It was interesting to compare the feel of the 2 rules. 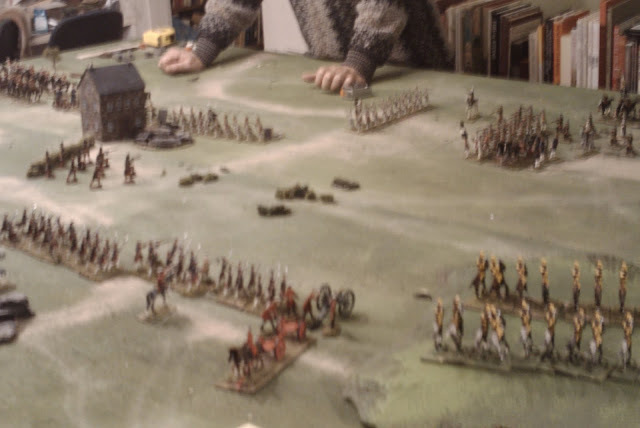 Probably the key points were that the games were both enjoyable and took about the same time to play and, perhaps most important, I think that ether game would have given much the same result regardless of which rules were used, if the sides had followed the same battleplans. That said, the games had a very different feel. The unpredictability in CD5 comes mainly from 2 things, the simultaneous movement based on hidden order chits and the morale results which can be drastic on a bad die roll, even for good troops. In BKC it comes from the command rolls. The moves and ranges in CD5 were longer but each turn took longer to play. In essence, each CD turn was roughly equal to 2 BKC turns or about 3 actions. The practical effect of this for me, was that in the CD5 game, I only had to make a decision 2 or 3 times during the game and the rest was just watching it play out. In BKC, I had to assess and make decisons about every 15 minutes and I had more nuanced game decisions to make, not just what my units were to do, but the best way to use my commanders to implement the plan and maximize the odds, (how to group the orders, what sequence to attempt them, how to use the CO to back up the HQ's etc). Horses for courses but from a purely gaming POV, I prefer the constant interaction, decison making and uncertainty management (attempted management) vs the more careful planning and execution. At last! A game in view! Not technically a Battlegame of the month as the scenario won't be one of the Battlegames magazine ones but a game none the less. 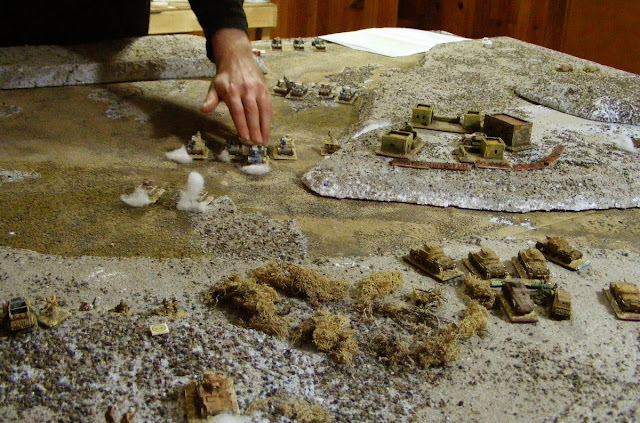 Back around Christmas, several of us got together to play a 15mm Western desert scenario using Command Decison V, Test of Battle. Saturday night if all goes well, Brits and Italians will meet again in a replay the same scenario but using Blitzkrieg Commander 2. Martin's cruisers to the rescue. Then if the world unfolds according to plan, I expect to try Boating on the River as a solo mid-19thC game later next week. Sighhhh, 1/2 way through February and only 4 solo games racked up. 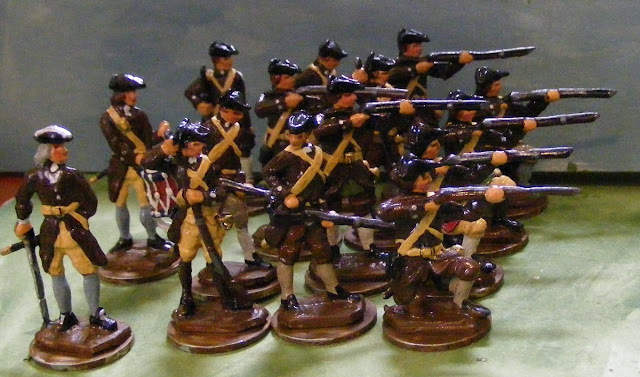 I did get inspired sufficiently to produce a unit of "militia" for the upcoming NQSYW Raid on St Michel. My first thought was to use a mix of loading, priming, firing figures in tricornes and a mix of uniforms & equipment (the loading/priming having open coats). Didn't seem very exciting though so my mind wandered onto the Pandours I was planning to add as light infantry. It occured to me that the original Russian pandours weren't raised as light infantry for the army but as a sort of frontier militia/border guards and that the organization for Light Infantry and Militia is virtually the same. AH-HA! Naturally I was up at the old farmhouse in Belmont at the time and the only ready reference, my Kannik's Unifrms of the World was back in Halifax. 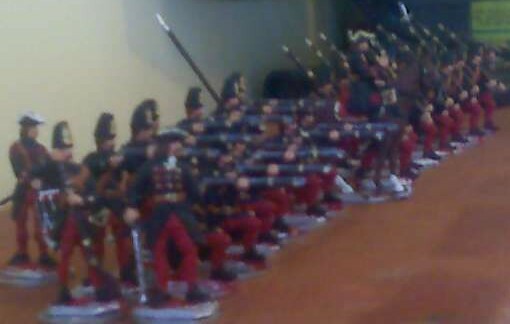 Relying purely on memory and keeping firmly in mind that this is for a fictional country anyway, I cast up 2 dozen grenadiers, cut down their caps to make up the typical tall felt cap and painted them in black coats with tight red pants. I debated adding red cuffs and lace but there's not much room on the chest of most semi-flat figures and what little there is is fully occupied by crossbelts and I figured coloured cuffs seemed mighty fancy for Rosmark Border Grenz types so I restricted chest lace to officers. My camera was also back in Halifax so here is a cellphone snap of the unit waiting for their Colours, 2nd coat of varnish and flocking. 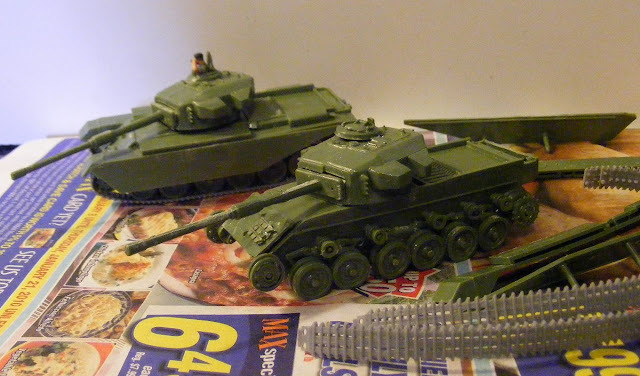 For an extra $20 or so dollars, I could have had two nice, assembled, including tracks, pre-painted, hefty, diecast Centurions but no, I had to save a few bucks and buy a couple of re-released Airfix kits. I was a ham fisted, incompetent model kit builder when I was a kid, what made me think I could do better now that I can barely see my hand in front of my face? Oh well, the wind may blow through the gaps and the rain seep in but based on the the first outing of the Roscian army, 1 Airfix Centurion is still worth 3 Rocco Minitank M60's! However, 'A' squadron of the the West Hants Horse is not quite ready for battle and 'C' Company of the Balimont Rifles hasn't mustered yet nor any of the Pherrie-Rhoad Fusiliers so the the Roscian army's appearance in a game of the month will have to wait a while longer. 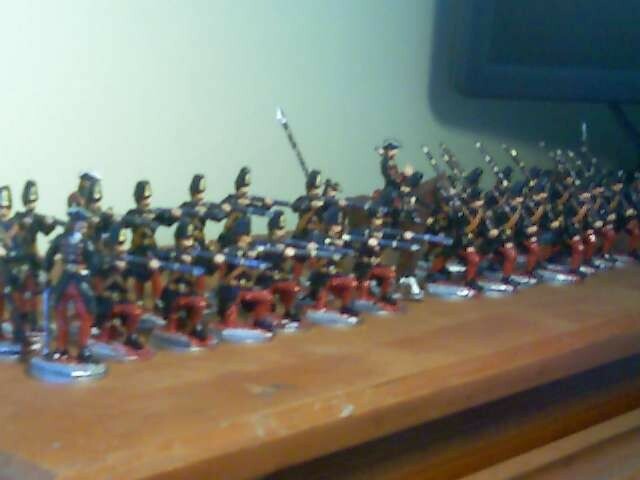 Instead, the Red Queen's troops will take the field or possibly the NQSYW Prince August semi-flats. Will it be "Boating on the River" (although skating on the river would feel more appropriate) or perhaps the generic version of River Canard?